This little frog is all ready to deliver a message and a candy bar. There is a space between the front and the back of the frog where a candy bar can be placed. The front insert on the frog is left blank on the pattern so you can write any message you want. I’ve put a Valentine’s message on the sample, but this little frog could also be used as a place card and favor holder. A message like, “ Hoppin’ you have a Happy Birthday,” or “I’m hoppin’ mad I forgot your birthday,” are just a couple of other possibilities. 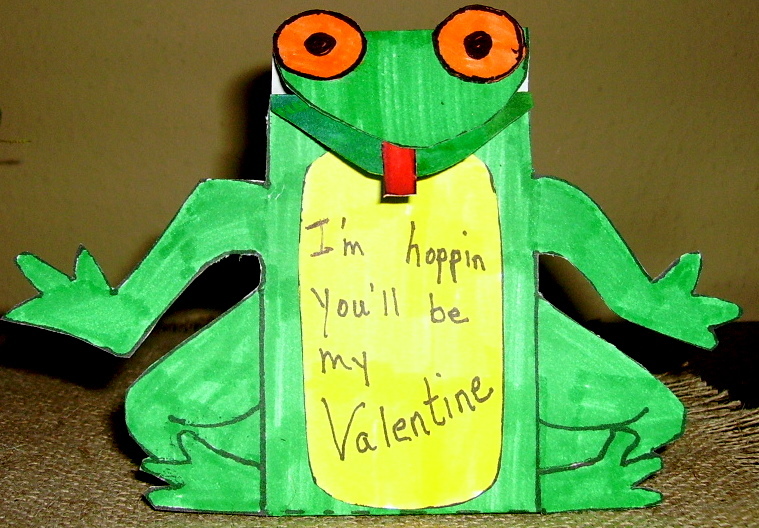 The directions for “Frog Card” can be found in the Valentine’s Day Projects Gallery in the sidebar. This entry was posted in Valentine's Day and tagged favor holder, frog, frog card, frog favor card for valentine day, place card, treat holder, valentine cards for kids to make, valentine craft for kids, valentine frog card, valentine projects for kids, valentines. Bookmark the permalink.